Successful students and teachers know that good time management is essential for high academic achievement, especially when education workloads get overwhelming. LightArrow Organizer helps busy students and teachers make the most of their time by helping them manage it wisely. The LightArrow Dashboard simplifies teachers’ and students’ daily activities by delivering important information in a single glance. Enjoy easy-to-read, accurate information at your fingertips, anytime and anywhere. Efficiently manage personal and professional contacts with LightArrow apps. Optional custom log forms allow addition of user-defined information about contacts. Organize contacts into iPad or iPhone contacts groups. CSV import and export and a spreadsheet-like management view are also available. Enjoy eight complete calendar and agenda views for better visibility into your daily agenda, monthly calendar, weekly calendar and yearly calendar. 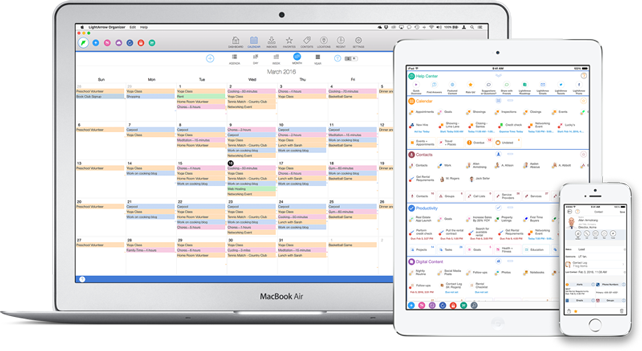 Schedule classes, appointments, reminders, tasks, and make to do lists in one app — all combined in a unified calendar. Complete project management keeps students and teachers on task. Track class and other projects and tasks and their delivery. Attach supporting information to projects, such as reminders, appointments, files, photos, expenses and more. Add participants and instantly communicate with this group of users. Students and teachers can filter email from senders across email accounts and narrow their search criteria by using specific keywords found in email messages. Be more efficient by converting email messages to actionable calendar items. Track academic goals and actions to reach those goals. Included metrics help you see your results. Track information related to your schooling and personal growth including assignments, education projects and education notes. LightArrow Organizer’s Inboxes combines information feeds from email, social media and the web and enables students and teachers to convert this information to activities, such as tasks – saving precious time. Save hours of switching from social media apps and email to gather information that you need. Students and teachers use a variety of websites and need to recall a number of usernames and passwords. Use the secure password and private information manager with strong, military-grade 256-bit AES encryption to store and locate passwords, secret codes, private photos and other information with ease. Teachers and students often collect digital content from different sources. Keeping this information organized is key to staying productive and informed. Bookmark things you find, make checklists and to do lists, take notes, securely store passwords, and access notes from your favorite cloud services such as Evernote® and ToodleDo®. Excellent for class notes. Record and add audio and video, add photos, and hand-write and draw with your finger or stylus. Drawing tools include 35 beautiful colors with alpha options; line width choices; eraser; clear; undo; and email capabilities for drawings. Printing is available for notes and drawings.